We’d love your help. 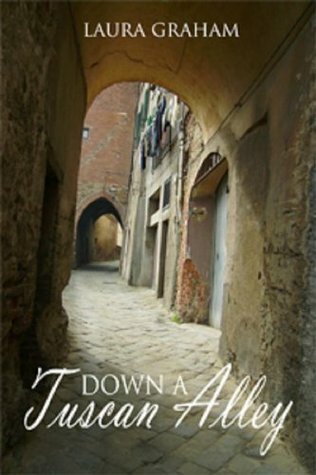 Let us know what’s wrong with this preview of Down a Tuscan Alley by Laura Graham. Laura Graham's story of her life changing move to Italy after a successful career as an actress on the London stage and in TV. Laura took the decision to move to Tuscany in Italy on her own except for her two cats. With very little money and a need to find a new way to survive this was the start of an amazing but scary adventure. To ask other readers questions about Down a Tuscan Alley, please sign up. 5 Stars and a “Must Read” Shout Out! I actually chose this book to read based on the reviews that are already on Amazon. This is a pleasant and enjoyable read even if its not your normal genre or style, which for me it isn’t. At first I was worried that I wouldn’t enjoy it because I don’t even know where Tuscany is and I have never been out of the United States so I was unsure if I could follow along. I am pleased to say that none of that mattered because this author very skillfully painted such 5 Stars and a “Must Read” Shout Out! I actually chose this book to read based on the reviews that are already on Amazon. This is a pleasant and enjoyable read even if its not your normal genre or style, which for me it isn’t. At first I was worried that I wouldn’t enjoy it because I don’t even know where Tuscany is and I have never been out of the United States so I was unsure if I could follow along. I am pleased to say that none of that mattered because this author very skillfully painted such wonderful images with her writing style and descriptive efforts; I fee like I have visited Italy and walked up and down that alley many times now and without the expensive airfare! I can’t help but use many of the same words already used to describe this book, creative, humorous, engaging, thought provoking, all very much true of this beautiful creation. I truly felt like I was watching these wonderful characters and laughing with them, Laura has a great sense of humour! I was sad to reach the end only because I could not continue to be part of their lives any longer. I hope Ms. Graham intends a sequel to this book as it would certainly be well received and readers could reunite with the beloved cast of this story. It was like taking a vacation to Italy but not seeing the tourist side of things and instead experiencing the reality of every day life there which is by far much more interesting! I had the opportunity to interview Laura Graham a couple of days ago and learned that this book is actually a memoire and these characters and adventures are part of her own personal history. It was very exciting to learn more about her after reading the book and seeing how truly amazing she is in person! The way she portrayed her main character, Lorri and allowed us to follow her as she put heartbreak, financial loss and the resulting language difference from the move to Italy behind her was inspiring and truly demonstrated courage on her part. Through the tale she weaves in her exceptional prose, we watch her grow and become stronger and happier while she adapts and adjusts and makes new friends, ultimately becoming a completely different person for all of the experiences. Thank you for sharing this personal journey with all of us! Check back later when I have read it.